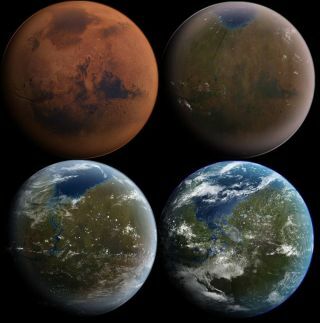 Artist's illustration depicting the terraforming of Mars — turning into a more Earth-like world. The hopes of turning Mars into a more Earth-like planet have just taken a hit. Science-fiction writers have long dreamed of terraforming Mars — changing the frigid Red Planet's climate to make it more suitable for human colonization. One potential way to do this involves freeing lots of heat-trapping carbon dioxide from the Martian crust back into the atmosphere. "If that's where all the CO2 had gone from an early thick atmosphere, that [terraforming] might be possible," said Bruce Jakosky, principal investigator of NASA's MAVEN mission, which has been studying the Martian atmosphere from orbit since November 2014. But MAVEN results announced Thursday (Nov. 5) show that the planet's CO2 went up rather than down: Shortly after Mars' global magnetic field shut down about 4.2 billion years ago, the solar wind and powerful sun explosions stripped away most of the planet's atmosphere, sending it off into space. That's bad news for terraforming advocates, according to Jakosky, who's based at the University of Colorado Boulder's Laboratory for Atmospheric and Space Physics. "It's not there," he said of the atmospheric CO2 during NASA's news conference Thursday announcing the MAVEN results. "It's been removed from the solar system entirely, so it's not possible to bring it back." This is not necessarily to say that terraforming Mars is impossible (there are many ideas about how to do it), or that the planet has no potentially accessible carbon dioxide. For example, Mars' two polar caps harbor some CO2 ice (though they're both composed primarily of water ice), and Martian soils soak up some carbon dioxide as well. But the new MAVEN discoveries suggest that making the Red Planet comfortable for human habitation — always viewed as a tall order — may be even tougher than previously thought. NASA plans to put boots on Mars in the relatively near future, whether or not terraforming is a viable option. The space agency is currently developing a roadmap that will send astronauts to visit a captured asteroid in lunar orbit space by 2025, then get people to the Red Planet in the 2030s. The $671 million MAVEN mission (whose name is short for Mars Atmosphere and Volatile Evolution) aims to help researchers better understand how and why Mars shifted from a relatively warm and wet world, complete with plentiful surface water, billions of years ago to the cold, dry planet we know today. To this end, the spacecraft has been studying the Martian atmosphere using eight different science instruments, measuring how quickly molecules are escaping to space and a number of other characteristics.